Lady Luck was on the side of two US brothers as they each scored lottery wins on the same day - but with very different results. One man is now a multimillionaire while the other’s winnings are barely worth the paper cheque they’re printed on, meaning any existing sibling rivalry could be about explode. Pennsylvania judge James Stocklas was on an annual fishing trip with relatives and friends to Florida, when he bought the lotto ticket that would ultimately make him rich beyond his wildest dreams. Stocklas had only popped into a roadside shop to buy ice, when he got the urge to take a chance on a couple of $1 Quick Pick lottery tickets - resulting in him banking a whopping $291,400,000, which he plans to share with a group of close buddies. 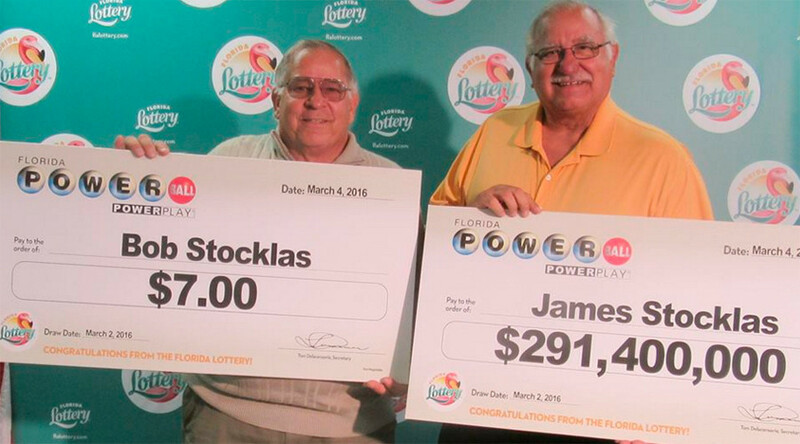 Unbeknownst to Stocklas, his brother was playing the Florida lottery at exactly the same time. Luck must run in the family because James’ brother Bob also took home some dollar bills from Wednesday’s Powerball sweepstakes. In fact he won seven of them, yep, $7. The pair have since been basking in the glory of their amazing slice of good fortune, even if the cash prizes differ vastly in size.